The grille gates, made of robust tubing with 50 mm of space between them, provide a high level of safety and ensure the roughage stays in the feeder. Feed can be replenished quickly and easily by opening any of the four grille gates which open out to the side. Opening width 130 cm. Two 325 m wide feed openings on each side of each grille gate ensure minimal feed waste. 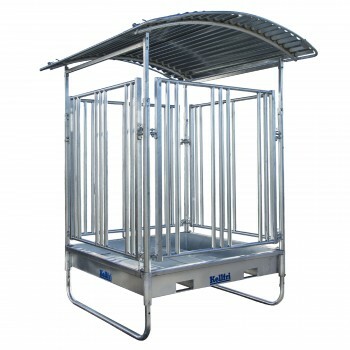 The roof is height-adjustable to offer the best protection against precipitation, and is also fitted as standard with a protection arch all the way around to offer the horses maximum safety.